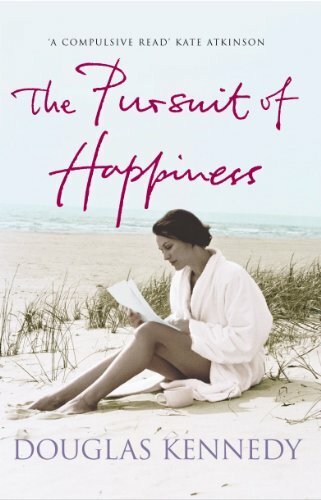 The Pursuit of Happiness by Douglas Kennedy has been sitting on my bookshelves for so long I can’t remember when I bought it. It was one of the first books I recorded on LibraryThing in 2007, so I already had it then. I must have bought it sometime between 2002 when it was published and 2007. It is one of those chunky books, 646 pages, that I keep thinking I’ll read one of these days, and then I pick up a shorter book, or a book I’ve just bought or borrowed and it stays on the shelf. It’s time to decide whether to read it or not. New York, 1945 – Sara Smythe, a young, beautiful and intelligent woman, ready to make her own way in the big city attends her brothers Thanksgiving Eve party. As the party gets into full swing, in walks Jack Malone, a US Army journalist back from a defeated Germany and a man unlike any Sara has ever met before – one who is destined to change Sara’s future forever. But finding love isn’t the same as finding happiness – as Sara and Jack soon find out. In post-war America chance meetings aren’t always as they seem, and people’s choices can often have profound repercussions. Sara and Jack find they are subject to forces beyond their control and that their destinies are formed by more than just circumstance. In this world of intrigue and emotional conflict, Sara must fight to survive -against Jack, as much as for him. In this mesmerising tale of longing and betrayal, The Pursuit of Happiness is a great tragic love story; a tale of divided loyalties, decisive moral choices, and the random workings of destiny. I first saw her standing near my mother’s coffin. She was in her seventies – a tall, angular woman, withe fine grey hair gathered in a compact bun at the back of her neck. She looked the way I hope to look if I ever make it to her birthday. She stood very erect, her spine refusing to hunch over with age. Her bone structure was flawless. Her skin had stayed smooth. Whatever wrinkles she had didn’t cleave her face. Rather they lent it character, gravitas. She was still handsome – in a subdued, patrician way. You could tell that, once upon a time, men probably found her beautiful. Every Tuesday, Jenn from Books And A Beat hosts Teaser Tuesdays at which time participants grab their current read, open to a random page, and share two or three “teaser” sentences from that page while avoiding any spoilers. ‘Who the hell are you? And what the hell is this?’ I said, again holding up the photo album as if it was the smoking gun in a murder trial. What do you think? Would you keep on reading?